Research in our lab focuses on how we see things move. We treat visual motion as a model system for investigating how the brain integrates information over space and time— as well as how these neural signals guide intelligent actions in a dynamic world. Focusing our efforts within this framework allows us to study both the encoding and decoding of neural signals along a continuous pathway in the primate brain. In essence, we take an empirical perspective towards the underlying goal of understanding the neural code in cortex, i.e., what do action potentials and spike trains mean, given their location in the circuit and within a particular behavioral context? 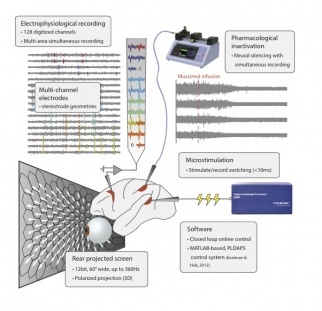 The lab employs a variety of methods, including single-unit electrophysiology (with a current emphasis on multiple-neuron / multiple-area simultaneous recordings), functional magnetic resonance imaging, psychophysics, and computational modeling. We collaborate extensively with Larry Cormack and Jonathan Pillow.